After releasing Alpha3 last week, the development team is working on fixing outstanding bugs and getting ready for the first Beta release. As I mentioned in a previous blog post, we are now working on transitioning existing hard coded profile fields – such as occupation or location – to custom profile fields. The pull request converting location to a custom profile field also introduced a new option to display custom profile fields on the memberlist. As we are turning hard coded fields into custom profile fields, we are ensuring that all previous functionality can be achieved through configuration. At the same time these options can now be used for other custom profile fields you may wish to display. As we fixed a bug regarding the display of avatars in notifications I want to use this opportunity to show you the new notifications functionality we built into phpBB Ascraeus 3.1. You may be familiar with the concept of a central location for notifications from Facebook or Google+. The idea is to provide users with a single location that will inform them about all the activity they are interested in. So far this includes notifications regarding posts, such as replies to bookmarked or subscribed topics or posts you have been quoted in, notifications regarding moderation of newly submitted posts waiting for approval and reported posts as well as notifications for new private messages and requests to join a group you lead. You can configure whether and how you would like to be notified for each of these notification types individually in the User Control Panel. The options are email, Jabber or the notification on the website. Extensions can easily add new notification types making the system very flexible. Further we’re now testing phpBB automatically with the alpha releases of PHP 5.6 on Travis CI. A final version of PHP 5.6 is expected this summer. We’re happy to announce the immediate availability of the third preview release of the upcoming phpBB 3.1, codenamed Ascraeus. As with previous releases we compiled a list of feature and bugfix highlights on our wiki. We now have a generic framework for dropdowns in prosilver. We’ve started to use it for the new topic tools button from where you can manage bookmarking, attachment downloads and subscriptions to topics. Topic titles now link directly to the oldest unread post. The only known issue remains that updating from 3.0 to 3.1 on Microsoft SQL Server is not possible. Thank you all for your feedback on the responsive version of prosilver which we published on Area51 last week. Your feedback has lead to a large number of improvements and corrections over the last days, the last of which will show up on Area51 later this week. Following the responsive version of prosilver, Arty has also finished a pull request for a responsive version of the Administration Control Panel. So you will be able to test the responsive ACP on your handheld devices in Alpha2 which should be released within the next 2 weeks. We integrated a pull request which enables CodeSniffer in our automated test suite. CodeSniffer is a tool which can automatically check our code for coding standard violations. A human readable version of the coding guidelines for Ascraeus is available at area51.phpbb.com/docs/31x/coding-guidelines.html. This change will ensure that every pull request and commit is automatically checked for misformatted code as part of our Travis CI builds. Some MOD authors have started to test the new extension system but we are still looking for more feedback and help with improving the extension documentation on the wiki. One of the improvements implemented this week expands the routing configuration for extensions to allow a definition of routes across multiple files. Routing is the process of matching a URL to a particular piece of code within an extension which is handled with the Symfony Routing Component in Ascraeus. Since the release of phpBB 3.1 Alpha1, the development and styles team have been busy working on further improvements to the version codenamed Ascraeus. Thanks to Arty finishing up his responsive design for prosilver pull request, phpBB’s default style now dynamically adapts to the screen size of the device used to browse the forum. 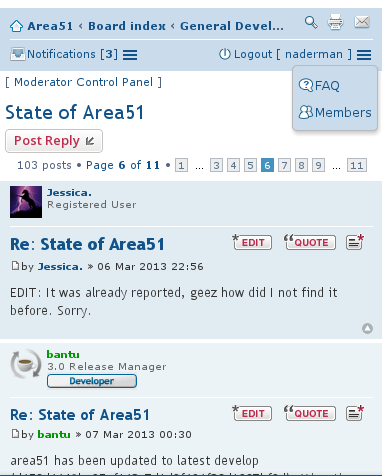 We’ve updated the Area51 forum to the latest development version so go visit it with your favourite handheld device and check out the differences to the desktop version! We’re still working out some kinks and trying to improve it, and the improved version of prosilver will ship with Alpha2 soon! In other news, our Travis CI build matrix has been updated to run our tests on MariaDB in addition to MySQL and PostgreSQL. Tests are automatically executed for every pull request sent to the GitHub phpBB repository. When they run through successfully, this is noted in green on GitHub so the developer reviewing the changes can be certain it did not unintentionally break other phpBB features. Today, we are pleased and excited to announce the first preview release of the upcoming phpBB 3.1, codenamed Ascraeus. Additionally, this marks the beginning of a number of significant improvements to the phpBB development process. Our new extension system replaces phpBB MODs with a flexible plugin system that does not require direct modification of code. 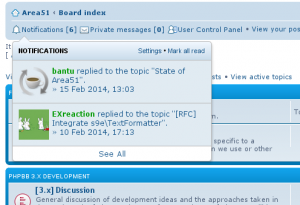 Consequently, updating phpBB forums will be easier than ever with potential for conflicts reduced to a minimum. This change also allows us to transition to a scheduled release cycle, with more drastic changes to the core now having less impact on the backwards compatibility of MODs. With this alpha release, the new extension system will be put through its paces. We wish phpBB 3.1 to offer a rich and smooth extension environment for developers, right from the start. MOD authors are asked to convert their MODs into 3.1 extensions and thereby assist us with identifying and reporting any shortcomings, no matter how small. It is particularly important that we provide all necessary events for extensions to offer the same level of flexibility that has been seen with MODs. Please help us complete the documentation on developing extensions on the wiki if you run into any poorly documented areas. You can review a continually evolving list of feature highlights on our wiki. This list will be completed as we approach the final release. Apart from the aforementioned extension system, we have worked on modernizing the phpBB experience for end users. The user interface now makes use of AJAX functionality. A new notification system, similar to those found on many modern web services, has been added. Gravatar integration for avatars is available by default. Login via third party services such as Facebook and Google is available. The new soft delete feature adds a “recycle bin” functionality to prevent accidental data loss. 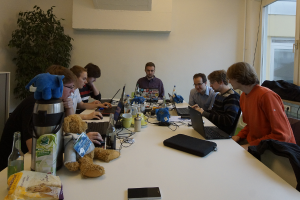 Behind the scenes, we have been making major changes to phpBB’s architecture. Over the last few years you may have seen us discussing plans for phpBB4 – a rewrite of phpBB based on the Symfony2 PHP web framework. In the time since, we have been gradually integrating Symfony components into phpBB 3.1. After much discussion and deliberation, we have determined that a full rewrite of the phpBB codebase is not the ideal process for achieving these major improvements. Instead, an iterative process of replacing individual subsystems within phpBB will allow users to see these improvements realized in shorter periods of time. We have already started this process, and most recently replaced phpBB’s old template engine with twig. The increased utilization of third party libraries allows us to dedicate more resources on improving the forum components while simultaneously benefiting from the improvements that third-party developers make to their components. You will therefore be seeing improvements we had originally planned for phpBB4 much sooner, in 3.1, 3.2, 3.3, and beyond. Once again, please use this release for testing purposes only. As always, we will provide no support for upgrading until the RC stage and urge users not to use testing releases in a production site. Please help us by reporting any bugs you find via a ticket on our tracker.